Oh, the comfort, the inexpressible comfort of feeling safe with a person, having neither to weigh thoughts, nor measure words, but pouring them all right out, just as they are-chaff and grain together-certain that a faithful hand will take and sift them, keep what is worth keeping and with the breath of kindness blow the rest away. i met her in north carolina...when i took my driver's test, i had to stop by the insurance office...that's where i met my friend. 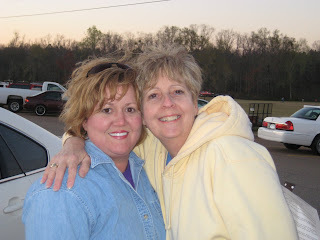 we hit it off immediately...we were both new to town, we had no children, were married to husbands with the same name, and discovered that we were sisters united in Christ. i'll never forget that day...it was the beginning of no ordinary friendship. we spent lots of time getting to know one another and when we had children, we spent lots of time making sure they knew one another. those days were magical...however, life did not stop for us...we now live in different places...different states...talk over the phone and see each other on occasion...BUT the memories linger and the ease of the friendship never changes...no expectations...no conditions...always accepting what is...nothing more. I treasure you, my friend! I have been having waaaay too much fun lately... creating! 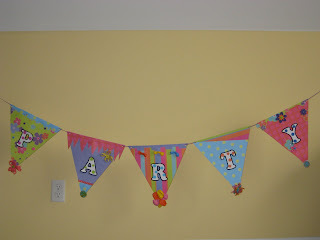 My passion is custom children's theme parties, hence the blog title, Queen of Theme. I got my business license a while ago, but I've been waiting for just the right time to take the leap. You see, of course, I want everything on my terms...the perfect number of parties (no stress), the perfect clients (easy to deal with), the perfect timing (when my husband is at work and my daughter has plans and I have nothing better to do), and the perfect financial agreement (little work - lots of dollars). I don't think I'm asking for too much, do you? No, really, on a serious note, I am very excited about my new business venture. 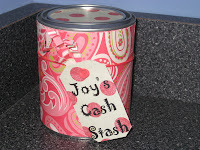 I'm kicking around the idea of classifying this business as a non-profit, so that I can create and throw fabulous custom theme parties and make a difference in a child's life all at the same time. 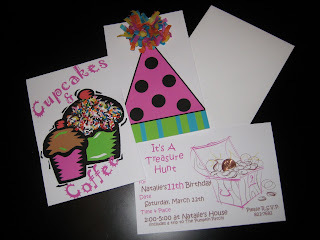 I contacted Ronald McDonald House and have already committed to donating a party for their auction this summer. Although this specific party will not be for an underprivileged child, it will still benefit a wonderful organization. I think I have a novel approach that would allow people to purchase my invitations, banners, party packs, etc. with the proceeds going to throw parties for deserving children. I'll have to do a little more investigating before I know if it is really feasible. In the meantime, I am in need of any thoughts, ideas or experience in the fund raising department. I need your help! I would LOVE to hear your suggestions! 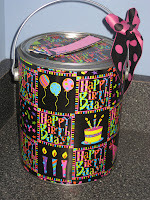 created a "party pail"...a twist on the commonly used gift bag. 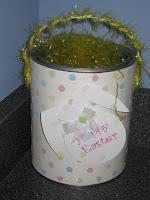 It's great because you can choose any kind of paper and design it with the recipient in mind! And if I can do it, anyone CAN!